the california supreme court has upheld prop 8.
marriage is banned in cali. civil rights are being denied. miss california is a joke...donald trump letting her keep her crown is a joke. Nominations in 27 competitive categories for the American Theatre Wing's 63rd Annual Antoinette Perry "Tony"® Awards were announced today by Tony Award Winners Cynthia Nixon and Lin-Manuel Miranda from the New York Public Library for the Performing Arts at Lincoln Center. RuPauls Drag Race Put ME ON THE SHOW!!! follow the link and get me on RuPauls Drag Race!!! ok kids listen up...broadway showstopper Nancy Anderson is in NYC to perform some fun blues numbers at The Laurie Beechman Theatre. The concert is tomorrow night, May 3rd at 7pm. 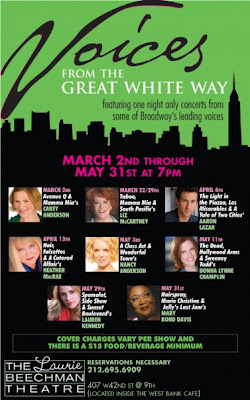 Nancy has appeared in A Class Act and Wonderful town as well as the hit dvd Kiss Me Kate along side Rachel York. She is sensational so please stop by the Laure Beechman Theatre at The West Bank Cafe on 42nd and 9th to see her belt it out. This is a rare opportunity due to Nancy being in California now. I have been asked to host the tri-city arts tour in asbury park, nj! i am so excited for this. be sure to come out and support theatre in the garden state. may 16th in asbury park nj!